For the longest time the Fawkes was under control by the Cardassian military, registered as CF-142AC and known as Mikral from the moment it was first constructed in 2335. 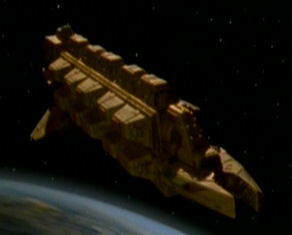 During the occupation of Bajor it was used as a carrier for raw materials within the Cardassian Union. In the latter years of the occupation, in 2367, the Mikral was captured by a Bajoran resistance cell. Having no use for it beyond its raw materials they choose to sell it off on the black market. Through connections with the Orion Syndicate they were able to find a buyer. During the time with the Orion Syndicate not much is known about its whereabouts. There are only two recorded instances where the transponder was flagged by a Federation installation. Once in 2379 when it docked with Starbase 47, it was flying under the name of Tashkilaa, named after a famous Orion warlord from the past. The second time in 2384 on that same station. It's thought to have routes in the vicinity of SB47 but has remained largely under the radar throughout its years there. In 2391 the vessel with registry CF-142AC showed back up in the Federation database but this time it was registered under the name of Fawkes, an independent freighter owned by the Heywood Corporation. It was given the standard designation of Star Ship (S.S.), which it now also displays on its hull and in official documentation. The Heywood Corporation, which is based on Fingrad VI, has no other major holdings and all day to day operations and contract negotiations are done by Mayterial Droz, who is the Captain of the vessel. For the most part the recent history of the Fawkes in Federation territory is rather humdrum. Moving between settlements and outposts to transport mundane shipments of supplies and people. That is until early 2395, when suddenly the name shows up in smuggling allegations. A widespread investigation comes to a close and the noose tightens around the crew of the Fawkes. Half a year of legal battle down the line the only one to walk out of the courtroom with their liberty intact is Mayterial Droz, Captain of the freighter. None of the other members of the crew could deny their involvement with the smuggling scandal.